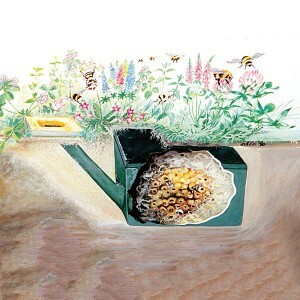 The SCHWEGLER Insect Combination Box is designed to encourage useful insects to live in your garden. 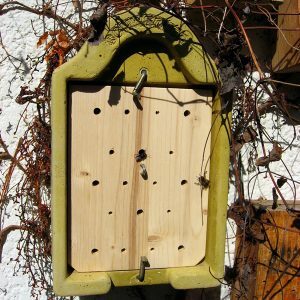 Internal slats filled with different natural ­materials offer suitable accommodation for many useful species which fulfil an important regulatory or pollination function in our natural world. 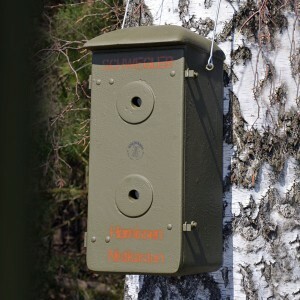 The Insect Combi eliminates the need for poisonous chemicals in­ a garden measuring up to 400 … 500 m². Pest damage in a garden or in the countryside can be seen when certain plants become weak and diseased, die off or fail to develop properly. To a certain extent plants can protect themselves against weather conditions but when subjected to attack by pests their only defence is to rely on the natural enemies of these pests. 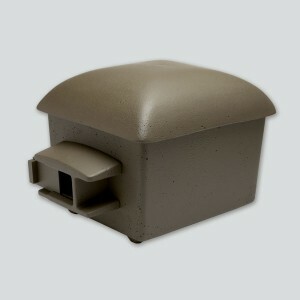 The Insect Combi helps to ensure the survival of these beneficial creatures. The different layouts and materials used in the Combi attract a wide number of species of useful creatures and they can hide or overwinter in it. Occupants live relatively independently of one another and can survive even in unfavourable conditions. 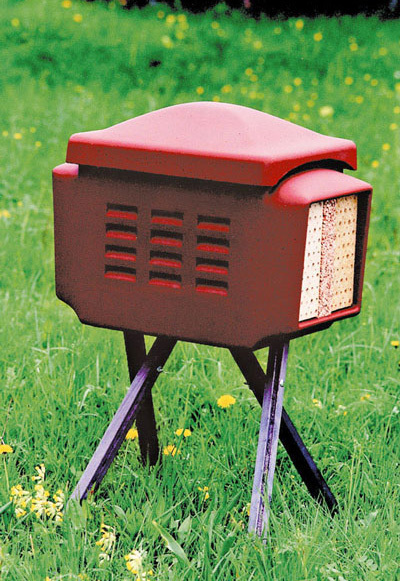 Most Insects fly into the box and those that cannot fly will climb into it from the specially designed wooden legs. 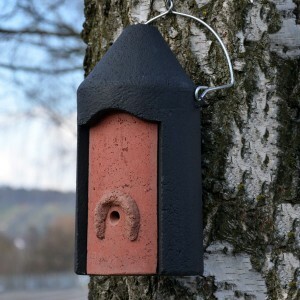 Occupants: Lacewings, Earwigs, Ladybirds, up to 200 different species of Wild Bees, Masked Hunters, Robber Flies, Thrips, Solitary Wasps and occasional Butterflies. 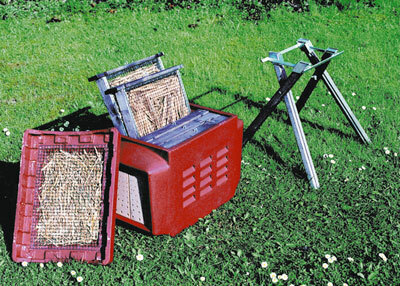 Siting: Sheltered from the weather in a sunny or semi-shaded spot in gardens, orchards, plant nurseries and parks. Long-term observations have shown that the useful creatures living in the combi will consume 60 – 90 % of the pests affecting cultivated and ornamental plants. These include, for example, Greenfly, Cabbage White Caterpillars, Cabbage Moth Caterpillars, Leaf-cutter Wasp larvae and Winter Moth larvae. 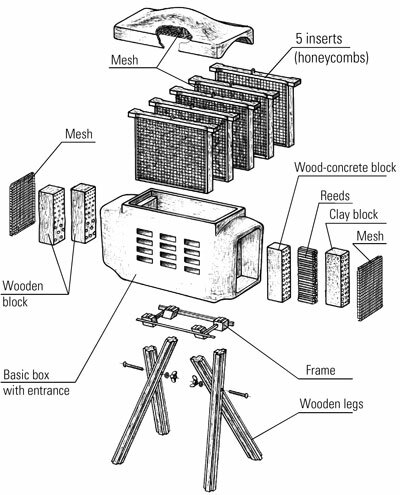 Material: The box is made of SCHWEGLER wood-concrete, with natural nesting materials, galvanized metal supporting frame and wooden legs. Dimensions: W 65 x H 50 x D 40 cm. Height when fully assembled: 1 m approx.